First Response® HIV 1-2-0 Card Test manufactured by Premier Medical Corporation was accepted for the WHO list of prequalified in vitro diagnostics and was listed on 14 July 2016. First Response® HIV 1-2-0 Card Test is a qualitative in vitro diagnostic test (immunochromatographic rapid diagnostic test) for the detection of antibodies of all classes specific to HIV-1 (including Group O) and HIV-2 in human serum, plasma andvenous or capillary whole blood. The test kit is not automated and does not require any additional instrument, it is intended for use by healthcare professionals. Reactive specimens should be confirmed by other methods. 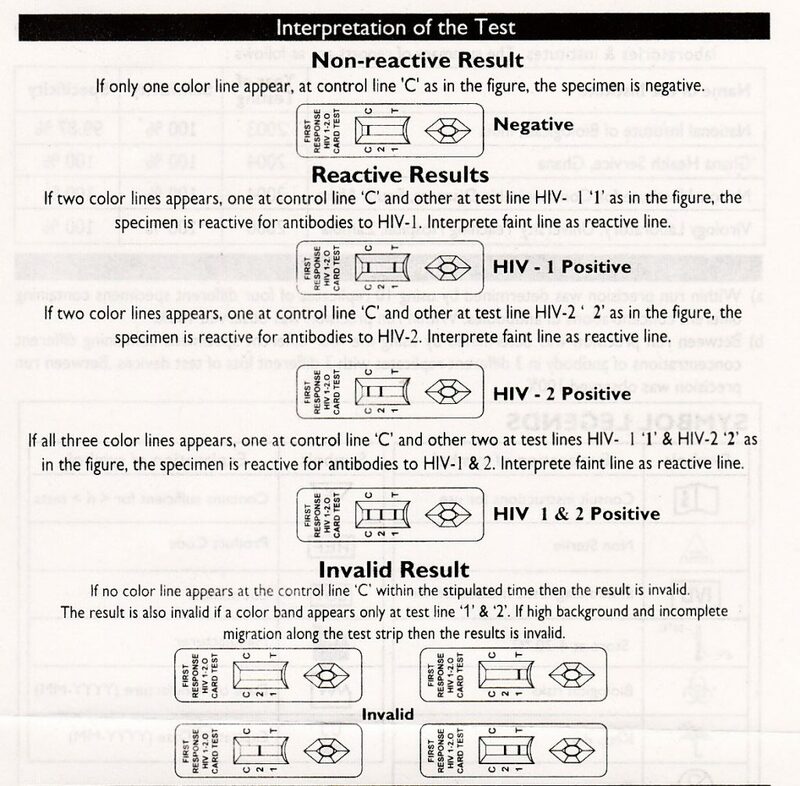 First Response® HIV 1-2-0 Card test contains a membrane strip, which is pre-coated with recombinant HIV-1 capture antigens (gp41 including subtype O and p24) on test band “1” region and with recombinant HIV-2 capture antigen (gp36) on test band “2” region, respectively on the test device. The recombinant HIV-1 and 2 antigens (gp41, p24 and gp36) colloidal gold conjugate and specimen moves along the membrane chromatographically to the test region and forms a visible line (test line) as the antigen antibody-antigen gold particle complex. The test kit should be stored at 4 °C to 30 °C. Interpret test results at 15 minutes. Do not interpret after 15 minutes. a) Within run precision was determined by using 10 replicates of four different specimens containing different concentrations of antibodies. Within run precision was observed 100%. b) Between run precision was determined by using four different specimens containing different concentrations of antibody in 3 different replicates with 3 different lots of test devices. Between run precision was observed 100%. 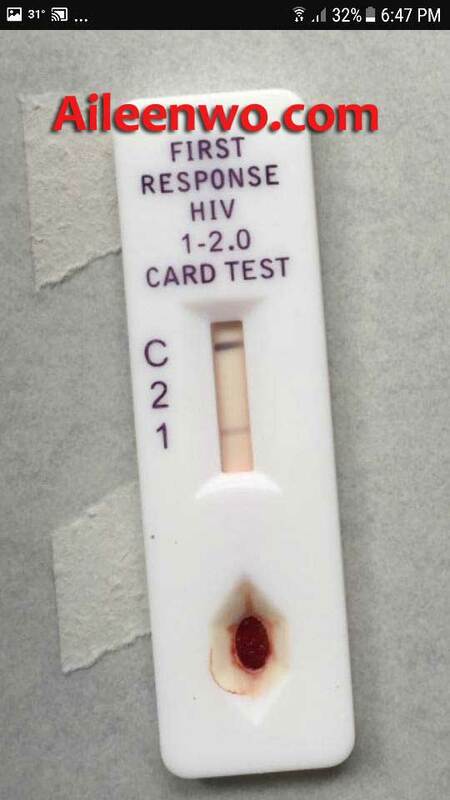 Bring the First Response HIV 1-2-O Card Test Kit components to room temperature prior to testing. Remove the Test Device and the sample pipette from the foil pouch and place it on a flat, dry surface. Slowly add 20 ul (Two drops) of Whole Blood to the sample well (S) using Sample Pipette. Add 35 ul (One Drop) of Assay Diluent to the sample well (S). Observe for development of colored bands in the Results Window. Interpret test results at 15 minutes. First Response HIV 1-2-O Card Test have been tested using an in-house panel of Positive and Negative clinical samples confirmed by a leading commercial anti-HIV 1& 2 ELISA KIT. The result shows that First Response HIV 1-2-O Card test is VERY ACCURATE COMPARED TO OTHER COMMERCIAL ELISA kit. This test kit gave results of sensitivity of 100%. Cepat buat pesanan sebelum stok masih ada !!! Pertama Response® HIV 1-2-0 Kad Ujian dibuat oleh Premier Medical Corporation telah diterima untuk senarai WHO sebanyak prequalified dalam diagnostik vitro dan telah disenaraikan pada 14 Julai 2016. Pertama Response® HIV 1-2-0 Kad ujian adalah kualitatif dalam vitro ujian diagnostik (immunochromatographic ujian diagnostik cepat) untuk mengesan antibodi semua kelas khusus untuk HIV-1 (termasuk Kumpulan O) dan HIV-2 dalam serum manusia, plasma andvenous atau kapilari darah keseluruhan. Kit ujian adalah tidak automatik dan tidak memerlukan apa-apa alat tambahan, ia bertujuan untuk digunakan oleh profesional penjagaan kesihatan. spesimen reaktif perlu disahkan dengan kaedah lain. Ujian pertama Response® HIV Kad 1-2-0 mengandungi jalur membran, yang pra-bersalut dengan rekombinan HIV-1 antigen tangkap (gp41 termasuk sub-jenis O dan P24) pada jalur ujian “1” rantau dan dengan rekombinan HIV-2 capture antigen (gp36) pada ujian band “2” rantau, masing-masing pada peranti ujian. Rekombinan HIV-1 dan 2 antigen (gp41, P24 dan gp36) koloid conjugate emas dan spesimen bergerak sepanjang membran chromatographically ke rantau ujian dan membentuk garis kelihatan (ujian line) sebagai antigen kompleks zarah emas antibodi antigen. Kit ujian harus disimpan pada 4 ° C hingga 30 ° C.
Mentafsir keputusan ujian pada 15 minit. Jangan mentafsir selepas 15 minit. Bawa First Response HIV 1-2-O komponen Test Card Kit ke suhu bilik sebelum ujian. Buang Peranti Ujian dan sampel pipet dari kantung foil dan letakkan di atas permukaan yang rata, kering. Perlahan-lahan menambah 20 ul (Dua titis) Darah Seluruh sampel telaga (S) menggunakan sampel Pipet. Menambah 35 ul (One Drop) dari Assay pencair sampel telaga (S). Perhatikan untuk pembangunan pita warna dalam Tetingkap Keputusan. Mentafsir keputusan ujian pada 15 minit.